How many photos do you have in your Camera roll on your iPhone right now? Go ahead and check. I’ll wait. 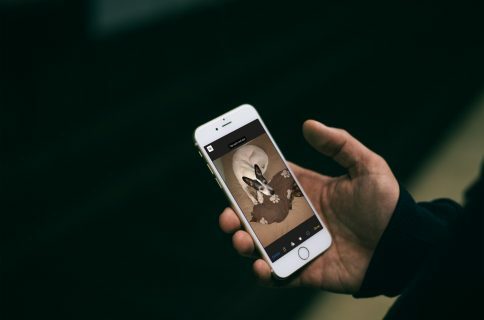 If you have a lot of images on your iOS device and want to reduce the amount of storage space they take up, there is a way to do it quickly and simply. Last week, we told you about four simple ways you can back up your photos so that, if something happens to your iPhone, you won’t lose your two-year-old daughter’s entire life in pictures. This week, we are going to tell you how to delete your photos from your camera roll so that you can clear out some much needed space in your iPhone. If you only have 16GB of storage on your iPhone and ten of those are being used for photos, you may want to remove some or all of them from your device. Before you follow the tutorial below, back up your photos somewhere. I can’t stress this enough. I don’t care how you do it, but back them up somewhere. After all of your images are either saved on your desktop or laptop, or stored in the cloud you can safely delete them from your iPhone. 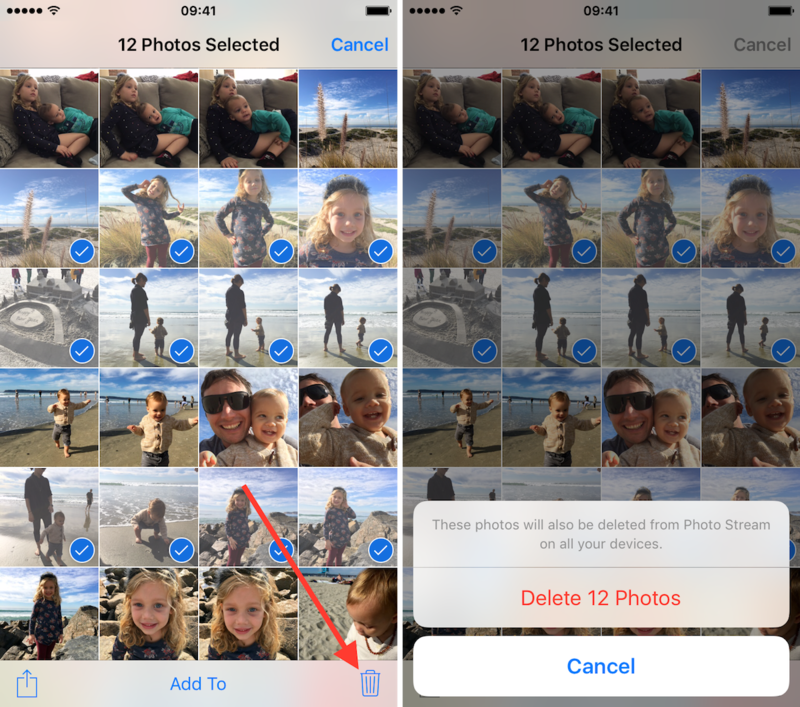 If you don’t have many photos on your iPhone, or if you want select specific photos to delete, you can do so manually in the Photos app. Step 1: Open your Photos app on your iPhone or iPad. Step 2: Select Albums > Camera Roll. Step 3: Tap the “Select” button in the upper right corner of the screen. Step 4: Select the images you want to remove. You will see a blue check mark next to images you select. Pro tip: you can drag your finger on the screen to select multiple images at once! Step 5: Tap the “Delete” button in the lower right corner of the screen. 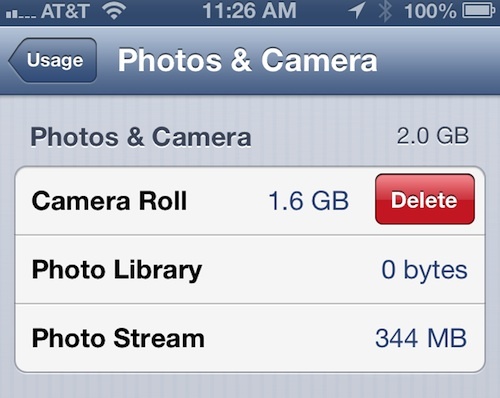 Back in the day of iOS 6 and earlier, there was an easy to way to delete all your photos and videos in one shot. Unfortunately, this option is not available anymore on devices running newer versions of iOS. 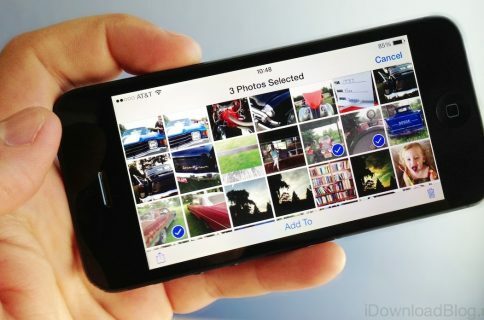 If you are still running an older version of iOS, you can still delete all photos at once. If you have way too many pictures to manually delete, you can remove them all in one shot in the Settings section of your iPhone. Step 1: Go to Settings > General > Usage. Step 2: Select Photos & Camera. 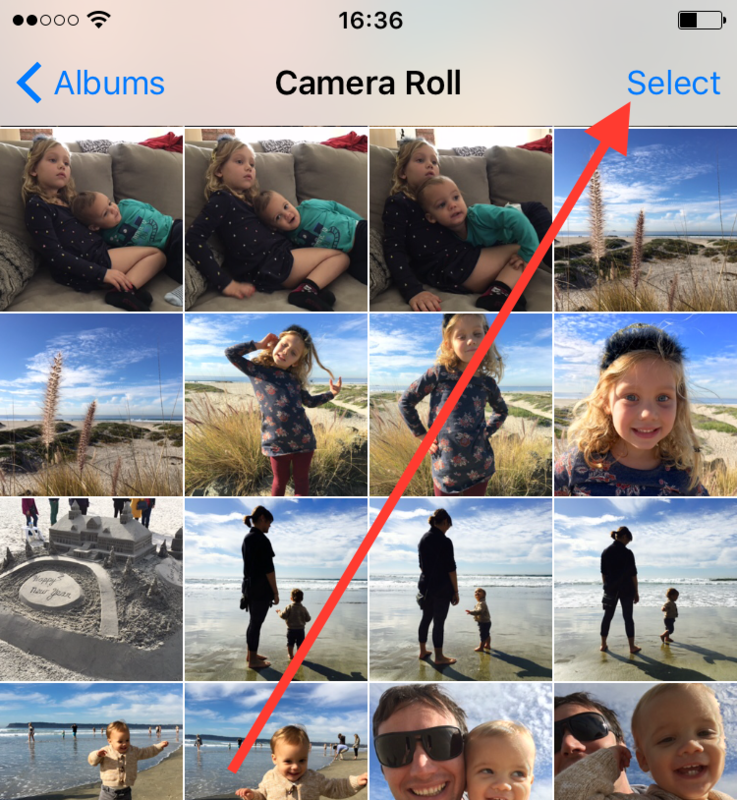 Step 3: Swipe your finger to the left under “Camera Roll” to delete all of the images on your iPhone. Don’t worry. You’ve backed them up. 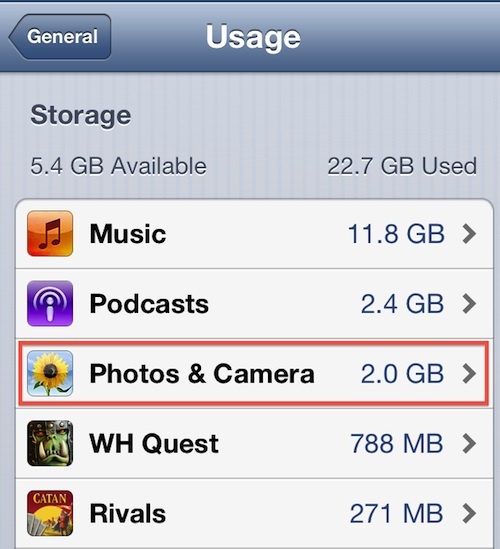 Plus, you can still see the last up to 1,000 photos right on your iPhone through Photo Stream. So, if you are out and about and want to show someone a picture you took last week, it will be there, waiting for you in Photo Stream. My Photo Stream allows you to save up to 1,000 photos for up to 30 days in the cloud, but these photos are also on your device. If you ever want to turn off My Photo Stream to free up room on your iPhone, it is as easy as flipping a switch. Step 1: Go to Settings > Photos & Camera. Step 2: Toggle “My Photo Stream” to off. 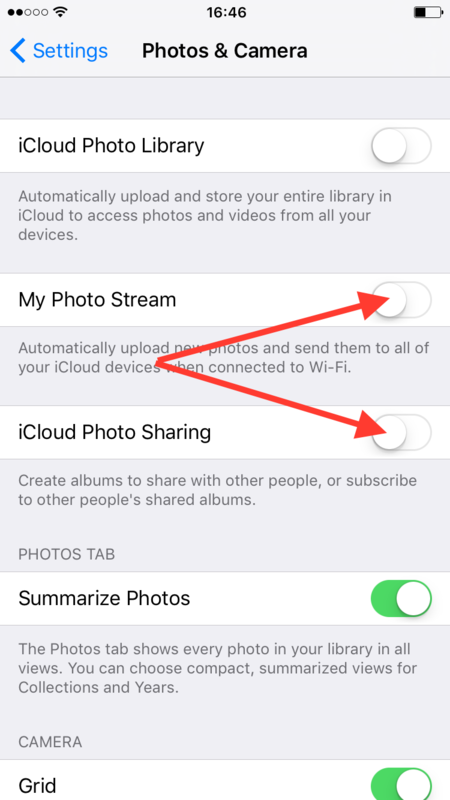 You can also toggle the “iCloud Photo Sharing” to off. This doesn’t delete any of the images from iCloud. It simply removes them from you iPhone. I actually turn My Photo Stream on and off at least twice per month when I have to download a really big app that I don’t quite have enough room for. This lets me temporarily free up space while the app is downloading. Then, I turn My Photo Stream back on. 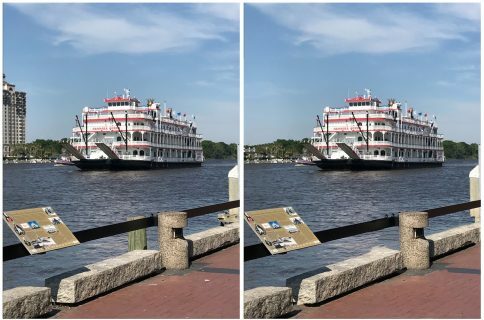 Reloading the images to your iPhone can take a while. Be sure you are connected to Wi-Fi while the pictures reload. 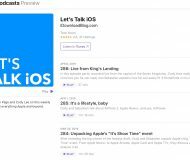 Now that your iPhone has been cleaned out a bit, you have room to add more apps, movies, music, and whatever you like to store on your iOS device. 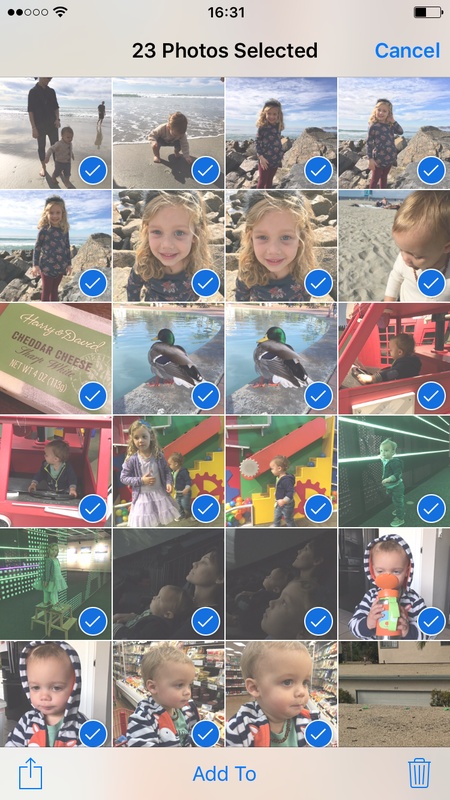 Do you regularly delete photos from your camera roll? If so, how do you go about it? Make sure to share your tips in the comments section below. 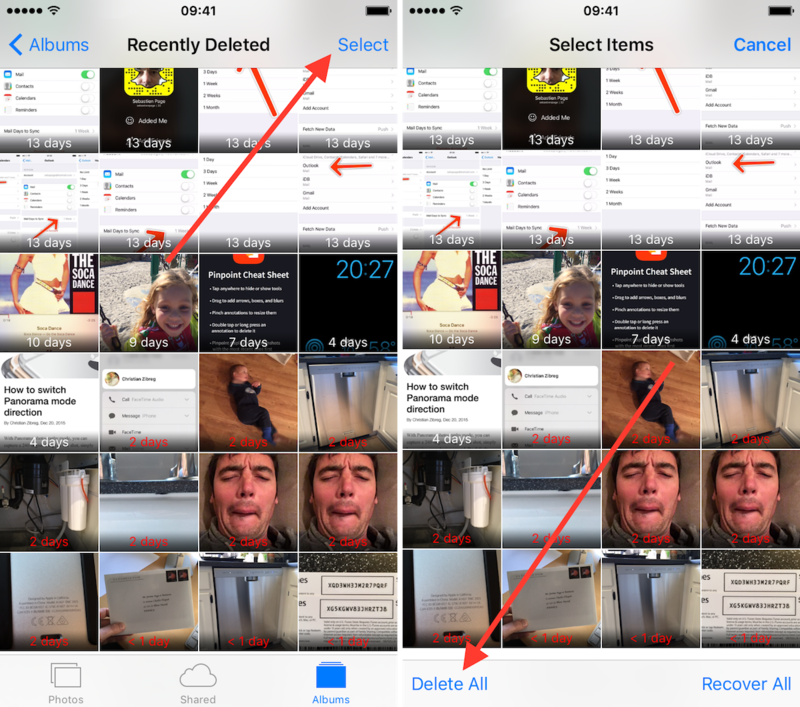 A new feature of iOS puts deleted photos into a temporary folder where they will be automatically deleted after 30 days. This is a great way to make sure you can always recover a photo after deleting it, but it because photos stay in this folder for 30 days, it kind of defeat our goal of making space on iPhone or iPad. So we’ll have to manually empty the trash. Step 1: Go to Photos > Albums. Step 2: Scroll down and look for the Recently Deleted folder. Tap on it to select it. Step 3: Tap Select in the upper right corner of the screen. You can then manually select photos one by one, or like we want to achieve here, delete them all. Step 4: Tap Delete All in the lower left corner of the screen. Confirm you want to delete the photos when prompted to. These photos will be gone forever.